On Friday, Miss Anne-Marie Osawemwemze Imafidon will be decorated by Her Majesty, Queen Elizabeth II, with the prestigious honour of Member of the Most Excellent British Empire (MBE) for her services to young women with specialty in Sciences, Technology, Engineering and Mathematics (STEM). The eldest daughter of Prof. Chris and Ann Imafidon from Edo State whose family has been dubbed the Brainiest Family in Europe, holds the record of being the youngest girl to ever pass two GCSE examinations — for Mathematics and Information Technology and A-level computing at the age of 11 in Britain. An MBE is an award given by the Queen to an individual for outstanding service to the community or local hands on service. Due to her high exceptional brilliance, she received a British Scholarship to study Mathematics at the John Hopkins University at the age of 13 in 2003. .
Two years later, she commenced a degree at Oxford University after which she enrolled for her Masters degree setting another record of the youngest Masters degree holder from the Ivy league university. .
Imafidon, who is a multi-linguist, speak six languages and has worked with Goldman Sachs, Hewlett-Packard, Deutsche Bank, and Lehman Brothers. 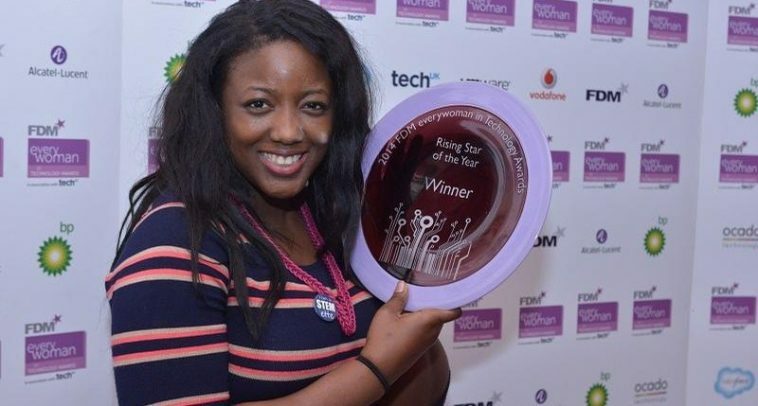 In 2013, she founded Stemettes, a social enterprise which inspires the next generation of women into pursuing careers in science, technology, engineering, and mathematics with an objective to break barriers women who pursue a career in the field face. Anne-Marie’s sister, Christina, 24, is the youngest student to ever get accepted and study at an undergraduate institution at any British university at 11; another sister, Samantha, 17, having passed two rigorous high school-level mathematics and statistics exams at the age of 6. Her twin brothers, Peter and Paul, made British history as the youngest students to ever enter high school when they became the youngest to ever pass the University of Cambridge’s advanced mathematics exam, setting world records by passing the A/AS-level math papers…Wow! this is really exceptional family!